You can always tell when the Our Best Bites girls are stressed out because we tend to post a lot of sweets. I had excellent intentions of posting a quick and easy dinner today, but I was overcome by the temptation of Pretzel M&Ms, which are simultaneously the most glorious and the most horrific creation in the history of creations. I promise, I’ll post something healthy next week. It seems like every fall, we start posting cereal and/or popcorn mixes. I’m not sure if it’s because of the hint of Halloween or the return of football and fall TV shows, but cereal mixes just feel right in the fall. This one is a little different from ones we’ve posted in days gone by because it calls for brown sugar instead of white sugar. Which brings us to caramel. Which, when you combine with salty nuts and Pretzel M&Ms, leads to sad feelings when you step on the scale the next day. First, line a baking sheet with waxed paper or aluminum foil and lightly spray it with non-stick cooking spray and set it aside. 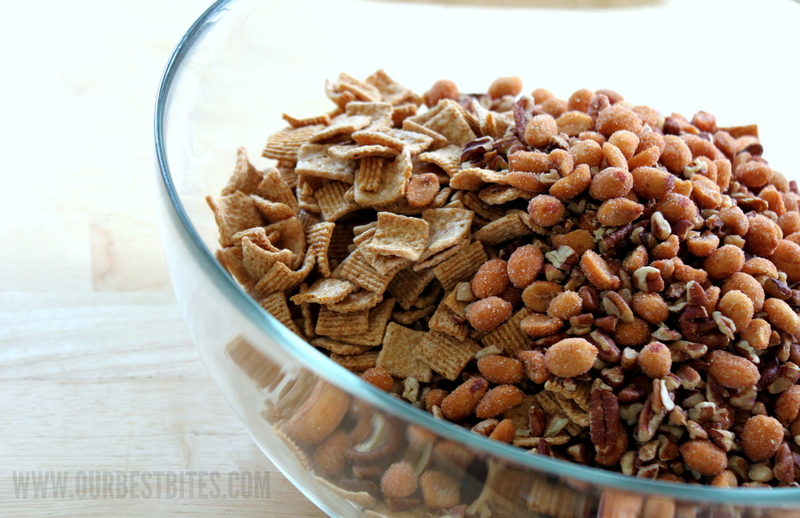 Then, combine some graham cracker cereal (like Honey Grahams) with some honey roasted peanuts and some salted cashews or macadamia nuts in a very large bowl and set that aside. In a medium saucepan, combine the brown sugar, Karo syrup, and a stick of butter (I told you this was bad) and bring it to a boil over medium heat. Continue boiling, stirring often, for 2 minutes (3 if you’re at a high elevation). When it’s done cooking, add a teaspoon of vanilla and stir to combine. Drizzle the caramel over the cereal mix and quickly stir the mixture to coat everything evenly. Transfer the mixture to the prepared baking sheet and allow it to cool for a few minutes, just to a point where the candy mixture has cooled but it’s not solid. 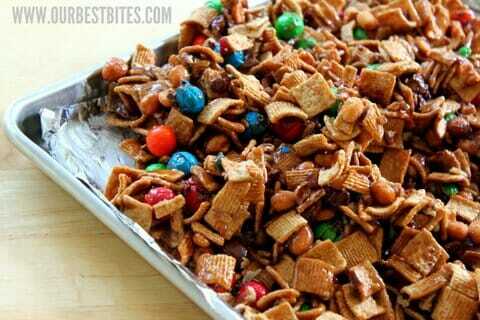 Add the Pretzel M&Ms and toss gently to combine. Allow it to cool completely (you can even pop it into the fridge to hurry things along) and then transfer it to a serving bowl or serve individual portions in small cups or cupcake liners. Unfortunately, we cannot be held liable for the lack of snacky self control that will accompany the presence of this mix in your house. Sorry about that. Line a baking sheet with aluminum foil or wax paper and lightly spray with nonstick cooking spray. Set aside. Toss together the cereal and the nuts in a large bowl and set aside. In a medium saucepan, combine the butter, brown sugar, and Karo syrup and cook over medium heat, stirring frequently, until it begins to boil. Allow to boil for 2 minutes (3 if you’re at a high elevation) and then remove from heat. Add the vanilla and stir until combined. Drizzle the caramel mixture over the cereal/nut mixture and stir quickly to combine. Transfer to the prepared baking sheet. When the caramel mixture has cooled but isn’t solid yet (just a few minutes), add the Pretzel M&Ms and toss gently to combine. Allow to cool completely before serving. This looks like an awesome recipe and I can’t wait to try it. In the ingredients it calls for vanilla but I don’t see where it is added in the directions. I assume this is done when you take the caramel mixture off the heat? If you could clarify, that would be great. Hi, Wende! Yep, it’s right after you remove it from heat. I changed the recipe. Thanks for pointing it out! Yeah, I probably could have done without that recipe. That would be a nice snack mix to take for the holidays though. This just made my “must try” list! This sounds so yummy! Great snack idea. this will be fun to make for General Conference weekend! Thanks for posting! Looks delicious! Can we expect another cookbook behind that stress? My college daughter (and her many friends all over the US) will LOVE this in their care packages! Sounds great! Unfortunately I am trying to keep the weight down (23 weeks pregnant) so I may save this to make as a holiday gift for family members with a small serving left for us as I will be close to delivery time! It seems like your stress has coincided with mine, because the last few treats you’ve posted I’ve had to make and consume within a few days of your posting. And they’ve all helped. This looks wonderful, and I can’t wait to try. And thanks a lot for updating the sidebar (sarcasm) – I’m going to get so fat this fall! EVery year for general conference we make “Conference Crunch” to eat as we listen and watch. This is very similar, but going to be the new “conference Crunch”. Thank you!! The recipe calls for cashews or macadamia nuts. In your picture it looks like you used pecans. Is that another option? Karo syrup….I’m not familiar with that? I’m up North here in Canada….it’s not an American thing is it? does it have to be real butter or is stick margarine o.k.?? Fiber One makes a new cereal called Caramel Delight that tastes a lot like Honey Grahams but more caramel-y. I bet it would be really good in this recipe plus the fiber cancels out the butter and m&ms, right? OMGoodness! This stuff is so yummy. Cool weather, football, colors changing, and snacks like this…what could be better! Thanks for sharing! One of the many things I love about you, Kate, is that you are always looking out for us high-elevators (or those who live at high altitudes). Not everyone out there is that sensitive to our situation. That’s what makes you special. Well, that and posting a snacky-dessert thing instead of a healthy, quick and easy dinner. You don’t hear me complaining do you? No, no you don’t. Oh, I want this! But what I really want is something that pops up on here telling me how many squats, mountain climbers, wind sprints, etc. I need to do in order to eat half the batch. Because I will. OK, healthy it’s not. But absolutely delicious well makes up for that!!!! Yummy. Thanks. would love to print recipe with picture…….. but without comments?????? I think you maybe need a warning sign in capitals for this mix. It is really good, thank you I think, my pant size may have just gone up. Love love your blog, it’s so much to read and so many wonderful things. You guys are great keep up the amazing job. Thanks for sharing your lives with us! I am sorry that you are stressed..but I love the sweets! Made this version, then had to make another batch but ran out of the M&Ms. Added in regular pretzels and candy corn and it was really good too, and seasonal. I think you could throw just about anything in here and it would taste fantastic! Had some of this at a football party last night. It was yummy. Definitely making this when we fly to Disneyland in a few weeks! Perfect to snack on during our little adventure!! By the way, love your blog and cookbook! Plan on getting your book for many people for Christmas this year! This looks delicious, but does it keep well for a few days or do you have to eat it all that day? A great snack for a game night, football party or when you have company visiting and want to set something out. I love the idea of individualizing them into cupcake liners. Anything for portion control, ha! is Karo syrup… with the “pancake” syrup. Just want to save my self twenty mintues of wandering around the grocery store. Thanks! Quick, easy and delicious! My son was “helping” me and added some water into my pre-measured M&Ms for me, so I had to sort through and gather all the water damage-less ones, so I only ended up using about 2 cups of them, but it still looked like it had plenty! Thanks Kate! I’d love to make this. Any ideas on a substitue for m & m’s? My son is allergic to milk. I was thinking of chocolate chips but thought there might be something better out there. CANDY CORN, IS THERE MILK IN THOSE LITTLE BUGGERS?? Can I just say this is AMAZING! Don’t make a full batch when you are alone or before your kids get home from school. Somehow it ends up eaten before anyone else can enjoy it. Yummy!! ALSO i USED CINNAMON TOAST CRUNCH! I was so excited to make this recipe so I picked up all the ingredients to make it tonight. I followed all of the directions to a “T” but my end product is very sticky and messy. Is that how it is supposed to be? How do you serve ti out of a large bowl? Is there somethign I should have done differently? Thanks for getting back. I’m still excited to serve it this week! Sinfully good!! 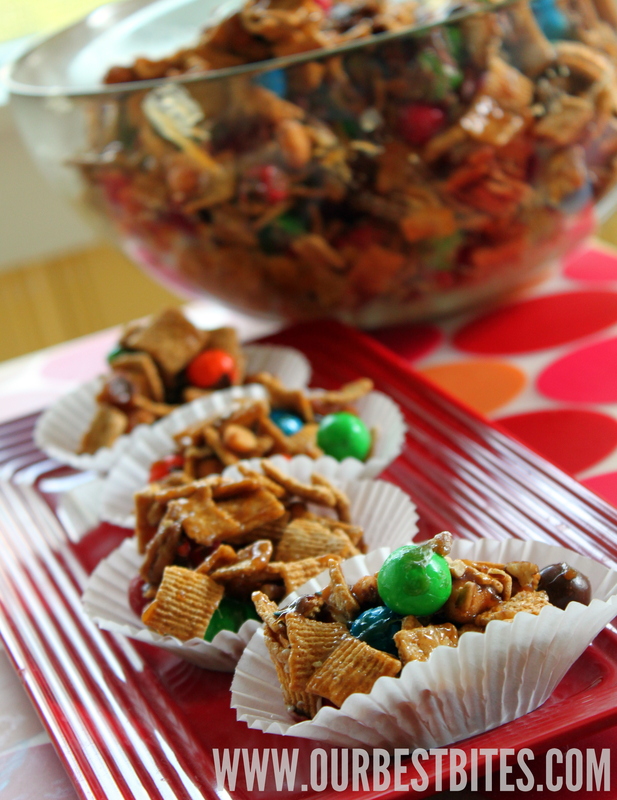 I can’t wait to make it again for neighborhood Christmas goodies using the Christmas pretzel shapes and Red and green M&M’s! We finally tried these today. They were deemed great by my husband and his brother and of couse, me. The only problem was I couldn’t get the m&ms to stick much. I followed the directions. But no matter, they are still yummilicious. I just finished making these & I ended up having to double the caramel part of the recipe. After do that my M&Ms seemed to stick better. Did I do something wrong? My daughter in college just made this and put it in cute gift bags for some of her guy friends on campus. One young man told her she could make a bucket-full for him the next time, it was so good. Thanks for the recipe! Do you bake this at all? I have the southern living recipe it was adapted from and I notice it is baked for 10 minutes before adding the pretzels. I just made this! It’s a keeper!! Thanks!! Can you use margarine for this recipe, or does it work better with real stick butter? Butter is almost almost always better. 🙂 I personally would use butter, but I imagine it would be okay with margarine. Just made this for our Super Bowl party tomorrow. I’m excited to get snacking! It smells so good — thanks for the recipe. Wow! This is just amazing. I have now made it three times. Two times to take for snacks to put in the teacher’s lounge. Let’s just say, I put it in there around 7:30 and it is gone by 9:45 when we go to rotation. Soooo Yummy!!!! 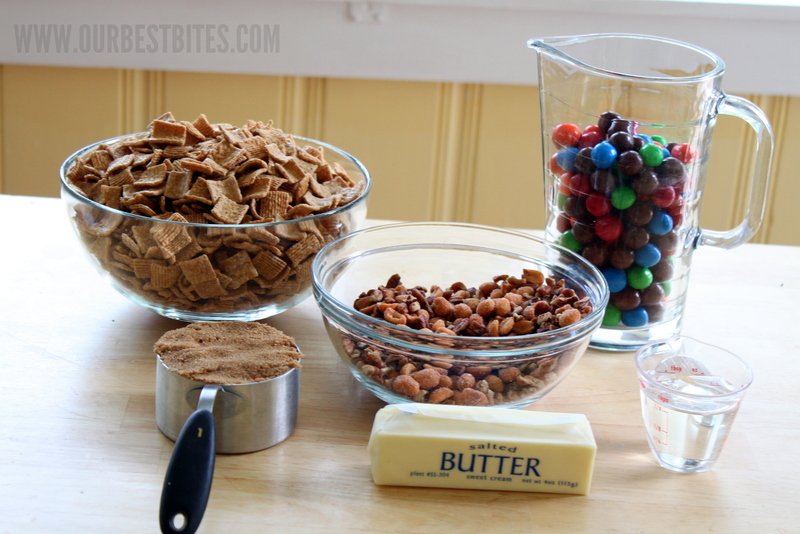 Would it work to replace the cereal with popcorn in this recipe? You can certainly try that, let us know how it goes! Next Post ❯ Next post: Personalized Online Recipe Box at OBB!